With the earnings season kicking off in a few days, what are the major themes investors should keep an eye on? It hasn’t been the best of quarters. A tumbling rupee along with rising crude oil prices have accelerated input cost pressures for import-reliant companies. Globally, fears of a fully blown trade war still loom. 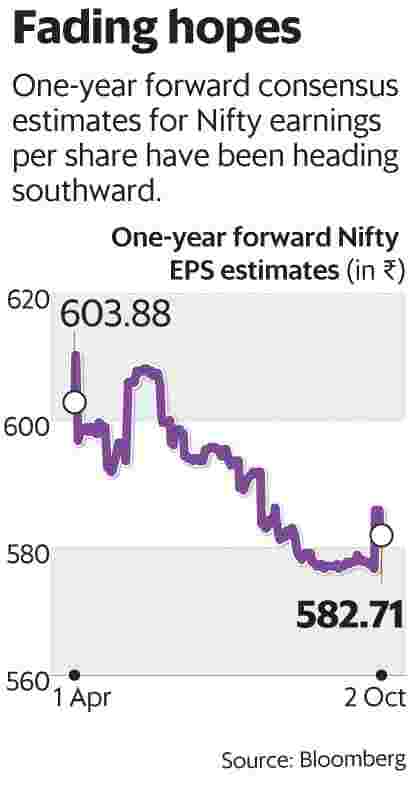 As a result, Bloomberg’s one-year forward consensus estimates for Nifty earnings per share are heading southward, dashing hopes of an early earnings recovery. Automobiles: Following the subdued monthly sales numbers, automobile manufacturers are expected to post unimpressive volume growth. Weak rural demand (owing to below normal monsoon), rising fuel prices and high interest rates are the dampeners. Concerns related to Brexit continue to haunt Tata Motors Ltd. So, investors would be closely watching commentary on its Jaguar Land Rover business. Investors would also want to know whether increasing global protectionism has hurt auto ancillary firms with a foreign presence such as Motherson Sumi Ltd and Bharat Forge Ltd.
Apart from commentary on market share gains, the outlook on margins would be vital and whether price hikes are in the offing. Aviation: Despite strong domestic passenger volume growth, airlines are poised for a hard landing in the September quarter. Inability to adequately raise fares points towards steeper losses for them in a seasonally weak quarter. Among stocks, the troubled Jet Airways (India) Ltd will be in focus and commentary on monetization of its frequent-flyer loyalty programme will be watched. Banks, non-banking financial companies (NBFCs): Public sector banks are expected to report weak results largely because of the 11 lenders under prompt corrective action of the Reserve Bank of India. The effects of the troubles at Infrastructure Leasing and Financial Services Ltd (IL&FS) are likely to reflect in banks’ provisioning and bad loan ratios. Apart from asset quality trends, commentary on further consolidation of public sector lenders will be watched. The northward trend in bond yields will lead to mark- to-market losses in banks. Some private sector banks have witnessed difficulties with reappointment of senior management and commentary on leadership change would be important. NBFCs have had a tumultuous quarter because of the liquidity concerns post the IL&FS fiasco. A key metric that investors in NBFC stocks would now watch is asset-liability management. Cement: Earnings expectations aren’t high given that September is a lean quarter for the sector. However, in the June quarter, cement producers hinted at some respite on the freight cost front due to the revised axle load norms. Investors would want to know if that has happened. Construction: The majority of companies are sitting on a healthy order book, so pace of execution will be key. However, in the run-up to the general election, order inflow guidance for the second half of the year will be in focus. Consumer goods: In the backdrop of sustained cost pressures, commentary from FMCG (fast-moving consumer goods) companies on price hikes and outlook on margins would be important. In the June quarter, companies had indicated that rural demand was ahead of urban demand. Commentary on whether that has sustained is a key factor to watch out for. For consumer non-durables, it remains to be seen if companies would pass on the burden of recently raised customs duties given the forthcoming festive season. Information technology (IT): In a seasonally strong quarter, the impact of steep rupee depreciation on margins will be watched. According to analysts, deal closures and wins have picked up for IT companies and that augurs well for growth. Investors in IT stocks usually focus on the annual revenue growth guidance by sector giants Infosys Ltd and HCL Technologies Ltd. Apart from that, commentary/outlook on IT spending in the US, and key verticals such as banking and financial services are some other cues. Metals: Concerns on rising trade conflicts between China and the US, and their impact on global demand growth remain for investors in these stocks. Import tariffs on metals such as steel and aluminium would have a bearing on price movements, so outlook on that front would be important. Although a weakening rupee against the US dollar is positive for companies in this sector, its benefits will be partially offset by weakness in other emerging market currencies. Power: Investors will be keen to know if companies in the listed space benefited from the recent spike in spot electricity prices. Also, commentary on the demand-supply situation, plant availability and inorganic growth will be keenly tracked. Telecom: Competitive intensity in the sector remains intense. Apart from the subscriber base, the outlook on average revenue per user will be important. Seasonal weakness and the initial impact of Reliance Jio Infocomm Ltd’s JioPhone Monsoon Hungama is expected to result in a higher sequential revenue decline for incumbents. Also, commentary on synergy benefits of the Vodafone Idea merger will be watched. Real estate: Earnings of companies having exposure to the flood-hit state of Kerala are expected to disappoint. Investors would want to know inventory levels and new launches in residential projects. In the commercial segment, vacancy levels are expected to come down. It should be noted that real estate companies adopted the Indian Accounting Standard 115 format starting June quarter, so the distortion in earnings remains.